Premium VPN providers are now using hijacked residential IP addresses in order for users to illicitly access territorially restricted video content. Using the “bait” of a free VPN service, users are unknowingly allowing their residential IP addresses to be “rented” to the highest bidder. Who are these highest bidders? 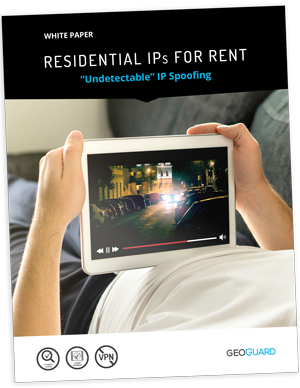 Mostly, other VPNs and DNS Proxies who charge their customers premium prices for “undetectable” IP spoofing via these residential IPs. How geolocation fraud undermines the territorial business model that content owners and rightsholders rely on for revenue. Whether you’re a content owner, rightsholder or OTT provider, this White Paper shows how geolocation fraud via “rented” residential IPs is impacting the content delivery ecosystem and how you can stop it!